Mompou did not produce these pared-down, elusive miniatures as a cycle: he composed each of them as discrete single entities at regular intervals over a 55-year period. The first twelve Cançons i danses were written for piano, as was the fourteenth. No. 13 was originally conceived for single guitar, while there is also a Cançó i dansa No 15 for organ (1976). This is rarely heard and is not included here: arranger and performer Mark Eden deemed it unsuitable for a two-guitar arrangement. Each piece broadly consists of a slow, brief Cançó (song) which acts as a prelude to a (typically) faster dance in a related key. 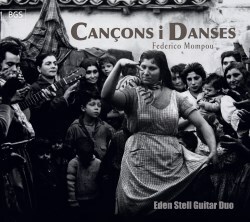 Many are based on Catalan folk-tunes but some are Mompou’s original creations. Familiarity honed over time ensures that all will get under the listener’s skin; inevitably, they are more direct than the 28 pieces of Mompou’s late masterpiece, the four books of Música Callada. The composer justified his adoption of the Cançó i dansa form thus: “(they provide)…a contrast between lyricism and rhythm, and avoid a collection of songs on the one hand and one of dances on the other; they rely on a natural, logical coincidence with a form adopted by many composers, such as Liszt…… Bartók……or (Pedro Humberto) Allende”. Given that the composer began and ended his life in Barcelona our cognitive schema might hasten assumptions that anything Mompou wrote might naturally have an Iberian character and would lend itself naturally to the guitar. Despite the fact that outside of the piano the instrument provided his main alternative expressive medium (there are songs, and a few choral and orchestral pieces as well – his output was very small) this is no more true of Mompou than it is of Satie, to whom he is most often compared. If the music (and for that matter the lives) of both could be described as ascetic, Satie’s is gravid with whimsy and irony, whereas Mompou’s is mostly pure and serious. In any case those of us who really admire Mompou will know all but one of these pieces as piano works. Nevertheless, such is Mark Eden’s taste and skill as an arranger, that they emerge quite unscathed in this two-guitar guise; indeed one gets to savour these wonderful and utterly timeless gems afresh. It seems to me that one has to truly love and feel this music to project its subtleties effectively. I have heard many a decent pianist make a bad job of Mompou. BGS issued this promo video of the first piece to help market the disc –it tells one all one needs to know about the Eden Stell Duo and their regard for this singular composer. There is real soul in this music and these guys consistently find it in these deeply humane, wonderfully unassuming performances. No.1 is arguably the most famous work in Mompou’s entire oeuvre – the ‘harmonics’ element he strives for in the original piano version of the work is given new life in this beautifully played and recorded account. No. 2’s courtly dance emerges with an authentic baroque grace on these instruments. The tender lullaby that opens No. 3 is followed by a sardana; if one didn’t know what was coming its opening seconds here suggest it could be Status Quo unplugged, while the Hot Club-like jazzisms of the second section really suit two guitars. The Lento litúrgico song of No. 5, funereal and slow, is brief but beautifully paced. At times such is the synchrony on display here one forgets that that this is a duo rather than a single player. The guitars also seem to inject an animation into the sophisticated dance of No. 6 which complements the purity of its preceding song’s lament in a most apposite manner. By the time this reviewer reached half way he had almost forgotten that these are arrangements of piano originals! The Eden Stell duo find a Ravelian delicacy in the Allegro dance of No. 9, while the stateliness projected in both elements of No. 10 emphasise the influence of ancient songs by King Alfonso X. They invest the strange unisons that open No. 11 with deeper, darker colours than one tends to notice on the piano. In truth these terrific players find something to say about all of these enigmatic and thoroughly modern pieces. The recording is detailed yet sympathetic throughout. I think even the most puritanically-minded of those who know Mompou’s piano originals will be pleasantly surprised. For newcomers to this extraordinary composer my advice would be to try and hear these pieces in both forms. The thing about Mompou is that one rarely falls under his spell on the first listen. Nor could this ever, in my view, be background music. One needs to turn one’s phone off, ensure that partners and offspring are preoccupied and simply listen. More than once. The rewards are potentially unlimited. The fantastic Eden Stell duo manage to extract every gram of essence from this music and re-present it tastefully and imaginatively. Mark Eden’s insightful, modest and beautifully written notes complete a most impressive issue.